Billy Connolly loves Scotland – though not enough to actually live there most of the time. It’s truths like that which mean his compatriots haven’t always reciprocated the adorayion. Hanging out with the royals, selling out to Hollywood, and – the biggest crime of the lot – not hating the English with a passion means that the comedian has often been given a hard time at home. Such griping can seem harsh, given that he’s always been something of an ambassador for his homeland – even if his more rough-edged version of Scotland is removed from the shortbread tin image the tourist board might prefer – after achieving his remarkable success from such unprepossessing beginnings. And that is what prompted this book, a ‘sortabiography', to borrow Eric Idle’s term, that looks back at the Big Yin’s life through a Scottish lens. Or alternatively looks at Scotland through the lens of his life, whichever you prefer. His incredibly tough childhood – so Dickensian it’s incredible to think it’s in living memory – was previously revealed by Connolly’s wife, Pamela Stephenson, in her comprehensive 2001 biography, called simply Billy, but it is repeated here. He was abandoned by his mother, who left the four-year-old Billy and his sister Florence in a tenement flat in Glasgow while their father was at war. Their lonely, starving tears alerted neighbours, who called the youngsters’ aunts who brought them up. But they bullied him, presumably through resentment at being cast into the role of carers, whole Billy was also tormented by the sadistic Catholic teachers at school, resorting to corporal punishment on any occasion. But he seems to harbour not a jot of anger or bitterness for those days, even if he would be entirely justified in doing so. Only once does he recall a visceral hatred stirring inside him when a fan who cheerily, and unwittingly, revealed himself to be the son of his chief tormentor. As would have been expected for a man of his generation, young Connolly went into industry, famously serving as a welder on the shipyards, which clearly moulded him as a comedian as he exchanged stories and played pranks to fit in with the older men. His life was predestined to be spend in the Clydebank factories, where industrial industries, a foreshortened life, and wages spent int the pub would have awaited him, had he not embraced the hippy culture and become by seduced by blues records and firebrand politics. He must have cut quite the figure among his welder mates, dressed in Cuban heels and three-button suit. He took up the banjo and formed a band called the Humblebums alongside Gerry Rafferty, of subsequent Baker Street and Stuck In The Middle With You fame, and as his banter between the tracks got longer, and the time playing got shorter, he fell into comedy. Although such biographical details are well-known, they are regaled again with enthusiasm and humour, as you might expect. And the pictures Connolly paints of the Glasgow of his youth are vivid, as well they might be as he’s kept them alive for the past 50 years in his stand-up. Made In Scotland also has Connolly mulling over what defines being Scottish, as well as proclaiming his love of its landscapes, its humour, its hearty - or unhealthy - food and even its bagpipes. He’s never had any time for nationalism, though and has never joined the calls for Scottish independence – although Brexit might have changed all that. In a long footnote he muses that the breaking up of the harmony of the European Union is ‘a crime bordering on a sin’ that he’s coming around to independence if it were to be a way of Scotland remain in in the EU. As has been well-publicised, he also discusses his diagnosis with Parkinson’s disease, and includes an enlightening conversation with research scientist Sir Ian Wilmut, who both knows about and has the disease. It is one of several dialogues that are intercut with Connolly’s reminiscences of Scotland, and by far the best. Other chats with his mates or the men who runs a charity for retired folk are tangential and sometimes self-indulgent, presumably culled from the BBC series about Scotland that Connolly is also making. 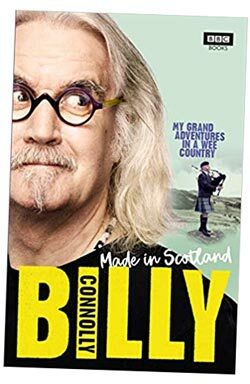 • Made In Scotland: My Grand Adventures in a Wee Country by Billy Connolly has been published by BBC Books, priced £20. Click here to buy from Amazon, priced £13.